The workshop is addressed to students of architecture and civil engineering faculties at master level. The selected students will have full scholarship that will include travel, board and lodging in Tallinn for 5 days (arrival on Tuesday 20.09.2016 departure on Sunday 25.09.2016). The workshop is funded by the NORDPLUS programme of the Nordic Council of Ministers (NCM) - Higher Education objective (project title: Environmental Computational Design and Planning Workshop - project ID: NPHE-2015/10036). The use of scripting and programming in computational design is increasingly important for researchers, architects, designers and engineers. It permits to extend the basic functionalities of existing digital tools and to create tailored and ad-hoc procedures to achieve specific research and design targets. At the same time expand the potentialities of integration of environmental and energy aspects from the very early stages of the design and planning process. The implementation of customized routines allow students and professionals to increase the efficiency of their projects and the integration in the environment. - Create Python scripts for the realization of simple routines and design tasks. - Programming using Python functions for the realization of specific tools also in relation with environmental analysis. - Design using optimization methodologies for solving complex design tasks. - Practical work on the development of a tool or algorithm with specific function. 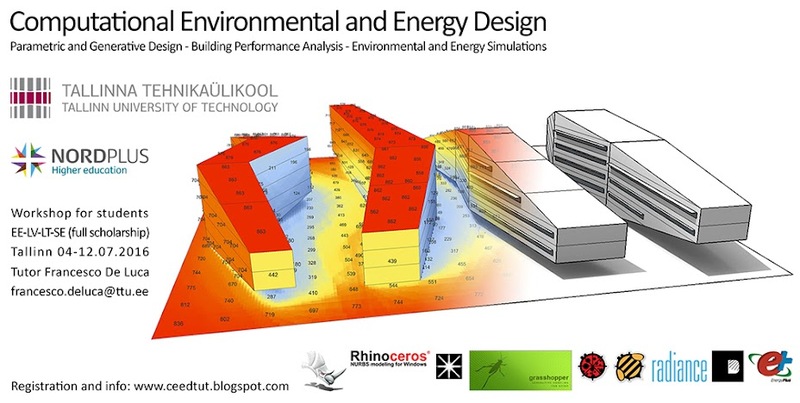 Is required proficiency with CAD and BIM software, parametric design tools (preferably Rhinoceros and Grasshopper), environmental analysis and simulation software. In the workshop there will be max 12 students from three/four different countries. Two from Sweden and Lithuania, if possible two from Latvia*, and six from Estonia. To request to participate in the workshop the students will have to write an email to Francesco De Luca at francesco.deluca@ttu.ee with motivation letter and a brief CV with indication of design experience, CAD, BIM and parametric software proficiency. The selection will be done on the base of: date of request by email, motivation letter, CV. * This September workshop is done with the remaining fund available from the July workshop. In this were present only students from Latvia for the foreign contingent, so for the September workshop students from Sweden and Lithuania have the priority. In case of vacant seats then students from Latvia can receive scholarship. The deadline for the request of registration is 11.09.2016. At the end of the workshop the students will present the work of study case design developed singularly or in small groups to show the process used to integrate computational methodologies with environmental and energy design tools and the outcomes. The workshop will grant 2 ECTS (24 hours class + 28 hours independent study). Agata Migalska, Wroclaw University of Technology, Architektura Parametryczna, Poland. Introduction to Python programming language and Python script component in Grasshopper. “Hello World!” to 3D fractals. Moving code into functions why and how to write them in Python. Enriching Python script components with input parameters: numbers, points, curves and surfaces. Case study: Panelization. Interacting with Rhino baking and objects attributes. Object Oriented Programming in Python and how to apply it to scripting in Grasshopper. Optimization Finding optimal panelization and solving other optimization problems using Galapagos (single objective optimization plugin based on Genetic Algorithm), Silvereye (optimization plugin based on Particle Swarm Optimization algorithm) and Octopus (multi-objective optimization plugin based on evolutionary principles).